OK. I’m ready for spring. Time to re-decorate my chameleon chandelier. It has been red… blue… orange… silver… and now it’s blue again. I started out spray painting the chandy in a turquoise color. I added a little bling, some nests I used on it last year, and the Faux Robin’s Eggs I just made. I used Museum Putty to help keep the nests in place. Now the birds. Their colors weren’t quite vibrant enough…. So I shot them with a light coat of the same spray paint I used on the chandy. Then I took a Sharpie and colored their eyes and beaks again. Then I wired the happy couple into place. …and tucked them around the nests. Check the bottom of this blog to see buttons for all the weekly Linky Parties! I wondered when that chandy would be out again! I honestly think that this is my favorite reincarnation. LOVE. Fabulous yard decoration! Fromthe looks of your house, it is a perect accompanyment!!! Wow that is utterly gorgeous! You’ve surely got the coolest front garden on the block! So pretty and I love that you keep re-painting it!! So clever to hang it from the plant hook too! Ahhh the infamous chandelier makes yet another fabulous appearance! I love the front entrance of your house. What are the windows to the left behind the chandelier that run down the walkway? what a cute idea. very original! btw-come back and comment under the giveaway post!! I’m having a little bitty giveaway! I just love love love your uber creative uber easy ideas!!!! I used to have a brass chandy just like this, but I think I expelled it years ago…such a great way to reuse an outdated item!!!! Shawn’s a Nosey Nelly isn’t she? I remember it being silver at Christmas time (pretty!!) and I went and checked out the other colors. I definitely didn’t like the orange. I’m not an orange person. If you live in Oklahoma and you cheer for the Sooners (instead of the OK State team who wear orange or the Texas Longhorns whom are also orange) then you would understand. But I LOVE that it’s a multi-functional piece for you. I really like this. I have something similar that I could do this with…and you’ve given me many ideas!!! hahaha….don’t you love blogging and blogger ideas? I’ve got so many I can’t do all of them! First time to your blog….enjoyed it very much! i super love this…a lot! The little chandi that never quits giving. I LOVE LOVE LOVE this Viv…I love everything about it, makes me so happy looking at it! How completely wonderful. I love your front yard chandy and it’s happy occupants! That is just delightful. I love it! I am in complete love over the spring chandelier!! It’s abbsolutely adorable!! Oh my word, what a cool and cute idea! I love it!! It looks so warm and nice outside there too..beautiful! You and your chandelier!! I love it! I think this version is my fav so far! That blue is gorgeous! Does this mean it’s time to put out my spring/easter decor? What a gorgeous chandelier…I LOVE IT. I am going to have to make one for my front porch…have you ever had a real bird lay eggs in the nests….we have a lot of wind here in Oklahoma where the color is orange…GO OSU COWBOYS!!!! I just had to say that in fun. aww too cute!! I love the blue color! I wonder how a chandy would work on a ranch. – I only would like to mention I am newbie to blogging and absolutely liked this web site website. Over likely I’ll bookmark your blog site . You absolutely appear with fantastic posts. Thanks a great deal for revealing your website. What a darling Chandy!!! Love the use of the bird nests and then to hang it on a sheperd’s hook- just too cute! really ready for spring! ain’t that a lovely chandy…wow! Ohmygosh I love it! So cute! The blue is perfect – so vibrant and fun! Really, seriously adorable!! I am on the lookout now for an old crappy chandelier I can turn into something spectacular. Just like you!! Oh my goodness! That is a beautiful chandalier, terrific job, you certainly are very talented! I love to make somehting like this, NOW! Thanks for sharing it. Thank you for visiting me and for your great comments on my post. I’ll be at Kathleens today with my St. Patty’s Table. That is so adorable. I love that you change it up so much. I think this one is my favorite so far!! Oh my…I am in love with your blog!!! The chandelier is to die for!! I have a chandelier hanging from my front porch that I LOVE….and so does everyone that see’s it! I decorate it at Christmas but you have inspired me to decorate it for Easter! I am a brand new blogger; therefore, I am learning! I would love for you to swing by my blog sometime!! Please leave a comment so I know you have been there! I plan to plant myself here for awhile…love everything I see!! LOVE it!! So cheery…the perfect thing for Spring!! Thanks for joining me for Make Something Mondays!! I just found your chandy post through the Embelishing Life party. I love it! And the fact that you redo it. Such a really genius idea! LOVE! Truly darling and really, really creative. Nice work. VIsiting today from Blue Cricket. that screams spring, love it! thanks for sharing this at my party!!! that screams spring! love it! thanks for sharing this at my party!!! Wonderful, I have a candlelier by my front door on a bishops hook too. Love the nest idea. saw you on savvy southern style. How very adorable is that chandy! What a wonderful way to welcome guests. What a cute idea!! I love all the little details!! I would love for you to come link up this project at my Tutorial Tuesday linky party. I have lots of moms who love crafting home decor! Such a creative design..love it! Thanks so much for linking this up..you know I love it! Oh, how fun is that! It’s just so daggone cute & charming. Can’t wait to spend more time on your blog. I’m new to your blog, visiting from Kara’s party. I’m also a new follower, & I hope you’ll take a peek at my blog & follow back if you find it interesting. This is SO cute! I love it, and I love that you put it outside, what a great and unique idea! That is so fun! I love it! I just bet you start a new trend. Maybe Target will buy the idea from you and start selling lawn chandys with interchangeable seasonal elements for accessorizing! Too cool! I love that you re-purpose the same item so many times over! Great inspiration! Found you at French Country Cottage and I LOVE this piece! It’s so bright and happy-I wish Spring would find it’s way to Utah already! I just love what you have done with the chandelier, it’s gorgeous… and how cool to hang it outside!!! I love that you redo this chandy for the seasons and holidays. Just gorgeous! So cool to hang it outside. I LOVE this! So creative! I featured this over on my blog today, come by and check it out! Wow this is INCREDIBLE! I might have to make one of these for my flower bed. What a fun and fantastic transformation! Thanks for linking this up too! Wow, this is awesome! Great job!!! Now that’s Adorable & Oh So Clever! So pretty. I would love to do something similar as decor for a Springy tea party. Wow this is fabulous! So perfect for spring! How are you doing, my friend! Long time…no see! Girlfriend, I have to tell you that your beautiful yard chandelier is just one of the most awesome things that I have seen!!! Seriously!!! What a GRAND idea! I love the blue color and adding the nests to each light was genius! It’s just gorgeous, my friend! Ohhh…now I will be keeping my eyes out for an inexpensive chandelier. I would love to make one of these for my yard!!! Thank you for sharing your creativity and talents with us…love, love, LOVE your chandelier!!! I love this. It is so springy and cute. oh what springy gorgeousness…so glad i’m not the only girl who knows how to change her decorating mind…love the blue and the little nesties…thanks so much for linking up to fridays unfolded! love this project. i’m always on the look out for new party decos and this is uber cool. spotted you at tater tots. will follow. have a good one. Wow, this is one beautiful chandelier. Thanks so much for sharing it at my Swing into Spring party. Hope to see you again next week. Love this so much! I have an ugly brass chandelier just like this and have been wondering what to do with it, think I know now! We must be on the same wavelength! I just added 4 nests to a standing candle chandelier. Ready to post next week on my blog. Would love to link to this one to show other versions. This is just beautiful and I am loving your pearls and the fact it is in your garden! So fun and beautiful! Bravo!! Thanks so much for linking up to Inspiration Friday this week! this is so cute and creative!! i love the pearls! thanks for linking it up. im going to have to make one now! Darling! Thanks for sharing this great idea. So beautiful!! You must be proud and you should be!! So happy you joined last weeks K.I.S.S. blog bash, (even though I don’t have GPS installed on my blog, wink!) your creativity is appreciated. Please remember tomorrow is another fun blog bash, drop by & share more inspiring ideas! It’s adorable! I love the little nests with the egg in them. HEY! Thanks for linking up! This is the cutest little thing I have ever seen!!! It looks beautiful. Thank you for linking up to More The Merrier. Love it this color and the birds nests are just a divine touch. I redid a light fixture recently to be a garden chandie too. I still need to get a tall enough shepherds hook to hang it in the fairy garden. OH WOW really great job!! such a cool chandelier! I love the color! Very pretty! I’d love for you to link up at Inspire Me Mondays! I have been looking for ideas for something to hang over my outdoor table on a covered patio….this is IT…….thanks for the great idea. Now for the fun of creating one adding my own touches…….what FUN! I picked up a chandelier at a garage sale last year. I have no place to hang it, but it was a good price. I haven’t even painted it yet…now, I’m picturing it on my plant hook on the porch instead of a hanging basket this year. That just might work. Thank you so much for the inspiration…yours is beautiful! post and tell me what you think! Thanks so much for sharing your darling chandy with all of us at NTT!!! You are rocking the casba! A n absolutely inspired idea. Lovely! Well look at that V! You’re featured on Sassy Sites! You’re famous! :) Good job, love the color! You have a great imagination. Wow! How innovative! A very colorful idea! How Clever to change it out! Love it. It also looks like your home is dreamy too! Very creative! It looks like something you’d find in Paris Market! That is so so so cute! I want a chandelier like that! Your spring decor is my favorite, but I love the other seasons/holidays decorated too. I am featuring this at somedaycrafts.blogspot.com. You have so many great ideas!!!! LOVE this! i love anything bird or nest. beautiful. This looks great! Thanks for linking up with me last week for Friday Favorites. I’m featuring your chandelier and your distressed artwork this week. Come by and grab my featured button if you’d like one. This has got to be the absolute cutest thing I ever did see!I want one in my yard too! Loving your blog-I’m your newest follower-stop on over for a visit!! That is so cute! Great idea to be able to change things up! Perfect for spring! Thanks for linking this up as well. I asked you to add my party button on another post you linked up but I noticed you had it in your sidebar so nevermind! 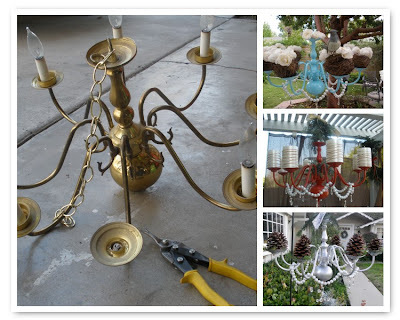 This spring chandelier has given me a awesome concept of making the pillar candles holders. I really like the nest shaped holders and the artiicial bird sitting on this.